This week I noted that Google had improved their site search offering and so thought I'd try it out. It actually looked very good and all seemed to work fine. I then did a search of the site using it and was a touch unhappy with the results. Like doing a search for "Cunningham" it display 1-10 results but didn't tell you how many total results it had found. I then got an email asking me if I had any information on a place name. So I used the new Google search for that name and it didn't find anything. I thought just out of curiosity that I'd use our old Live Search to see what it could find and it found one entry. Mmmm... so I then went on to do a search with Google for another name and it found 8 results. Using the Live Search it found 342 results. I then did a number of other searches using both search engines and without exception Live Search found many more than Google did. "Aois - The Celtic Community" - is our new community site which we've been working on for some time now. I should explain the whole system is made up of a variety of modules to which we'll eventually add an overall interface to bring everything together. This week we're able to announce the first stage of this project is now ready for use which is the vBulletin message forum system. While we're still working on adding more functionality we figure it's now solid enough to let you try out the messaging system. Also included you'll find the picture gallery, project planning facility, calendar, blog and rss feed. There are also elements of social networking and you can create a buddy list and your own private message forum. We have created a few public message forums to get you started. The index page is on our Scotchat domain where you'll see a very different type of page from our normal one. Should you decide to make this your new homepage you can still get to lots of the Electric Scotland menus from within our new menu system. Things will also change on that page as well as we get ramped up. I might add that a new header has been produced for the Electric Scotland site with a button included for the Aois community so it will always be easy to find. In compliance with safety for children we ask for your birthday when you register and that's to allow us to catch any children entering the system. Where we find them we'll ask that they provide a parents email address and we'll then email the parent telling them of the service and asking for their approval before we allow their child to use the system. There is also a Spam feature so if you report that someone is spamming then we'll be able to quickly remove their posts and ban them from the system. We can also add Moderators to help manage the system so if someone that posts regularly in our public forums would like to help moderate one of them do let us know. To join the service you will need to register as a new user and once completed we will email you at the email address you provided asking you to click a link in the email to verify you are who you say you are. This email will get to you within seconds or at worst within 5 minutes so do look for that and if it doesn't appear check your spam folder. Should you still not get it feel free to email me and I can manually verify you but hope that won't be necessary. This is just our attempt to ensure only genuine people get into the community. Two new books started this week, "Arbroath and its Abbey" and "Scotland's Influence on Civilization" for which see below. I might add that these new books are really hard to ocr into the site as they're using a slightly different font and so there are many errors which all have to be manually corrected and I'm sure I'll have missed a number of errors. Hopefully this won't prevent you from enjoying them. This is a Family Tree program and we've also created a couple of forums within Aois specifically for that site. Medics of the Glen is a series made for stv (Scottish Television) just a few years ago. It's currently being shown on www.scotlandontv.tv - we're up to episode six of fifteen right now. The remit of the series was to cover the challenges facing medicine in the remote, beautiful area of north-west Scotland and over a period of four months the production team was based on the Isle of Skye working with a GP practice and the local hospital. Whilst there, they soon appreciated that both the distance from specialist facilities at Raigmore Hospital in Inverness and the harshness of the terrain and the climate - made for dramatic medicine. For instance, if you live in a city and have stomach pains, a GP (family doctor) may undertake a time of careful watching but if you're many miles away, then the chances are an air ambulance will be called! The action in Medics of the Glen is played out against a background of dramatic and stunning scenery - so even if programming with a medical theme is ' not your thing', it's worth taking a look, just to get a feel for life in remote Scotland in the twenty-first century. The link here http://www.scotlandontv.tv/scotland_on_tv/video.html?vxSiteId=60fdd544-9c52-4e17-be7e-57a2a2d76992&vxChannel=Most%20Recent%20Videos&vxClipId=1380_SMG2128&vxBitrate=300 will take you to the most recent episode, but episodes one to five are there too if you want to start from the top. Welcoming the publication of opinion poll data in the Daily Telegraph which shows the SNP Government enjoying approval ratings of a majority and Alex Salmond far and away the favoured choice for First Minister SNP MSP Alasdair Allan said: "A year into government and the honeymoon continues, on the back of solid policy delivery. "Earlier this month, some of our key measures took effect – including freezing the Council Tax to deliver relief for hard pressed households, cutting business rates to boost the economy and jobs, abolishing prescription charges to end the tax on ill health in this 60th anniversary year of the NHS, and scrapping the graduate endowment to restore free education in Scotland. "We have also abolished bridge tolls and are delivering 1,000 more police officers on Scotland's streets. "These latest poll figures show that the people of Scotland trust Alex Salmond and the SNP government to deliver. "We are repaying that trust by breathing new life into Scottish democracy, and strengthening our public services. "With the vast majority of people viewing Alex Salmond as standing up for Scotland, and as a strong leader in touch with the concerns of the people of Scotland, it is clear that as we approach the first anniversary of the SNP's election success, the Scottish people know they made the right decision." The house was opened to the public in 1833, five months after the death of Sir Walter and has been open to visitors ever since. The house contains an impressive collection of historic relics, weapons and armour, including Rob Roy’s gun, dirk and sword, and an extensive library containing over 9000 rare volumes. Visitors are able to see Sir Walter’s Study, Library, Drawing Room, Entrance Hall, Armoury, Dining Room and the private Chapel which was built in 1855, after the writer’s death. 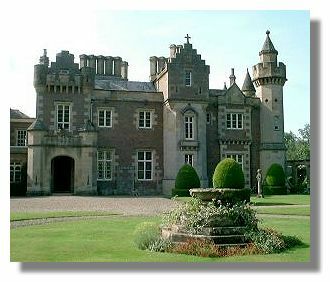 The visit extends to Sir Walter Scott’s garden and grounds and the chance to wander down to view his beloved Tweed. Visit http://www.scottsabbotsford.co.uk for full details of opening times and charges. The recipe this week was a great Border’s favourite and probably enjoyed by the great man himself – enjoy the flavour of the Borders in a heaped plate of Rumblethumps. Method: Slice the potatoes thickly and boil in a little salted water. Once cooked, drain and mash. Slice the cabbage and boil gently in slated water, do not over cook! Melt the butter in a heavy bottomed pan and cook the onions. Once soft through, add a little cream, season to taste and heat together. Place the mixture in an oven safe dish and cover with grated cheddar and place under a hot grill or oven to brown. Serves 4. Christina McKelvie MSP's weekly diary didn't make it in this week. The Deep Fried Mars Bar was invented in Stonehaven, Aberdeenshire, Scotland by the chippie, or chipper as they say in Grampian, Carron Fish and Chip Shop at Allardice Street in 1995. In 2007 the deep fried Mars bar was named as the 10th most unhealthy food ever. This hasn't stopped many regulars at the Carron Fish and Chip Shop from ordering their favourite deep fried Mars bar snack. The owner, John Wilson, still sells about 100 deep fried Mars bars each week. 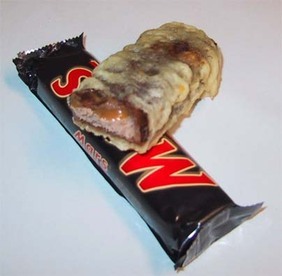 Variations of the deep fried Mars bar have appeared throughout Scotland and the UK. Examples are deep fried Snickers bars and deep fried creme eggs at Easter time. In December 2004 the doctor's magazine The Lancet published a study by Glasgow doctors Dr David Morrison and Doctor Mark Petticrew into the phenomenon of the deep fried Mars bar and found that 22% of chip shops in Scotland sold deep fried Mars Bars. Three quarters were sold to children whilst fifteen percent were sold to adolescents. The average price was 60 pence. An easy deep fried Mars bar recipe that you can try at home, though it really is not good for your health, is to beat a raw egg with 1/2 a tsp of water. Dip the Mars bar chocolate into the egg and ensure all of it gets covered in egg. Then put this into a batter mix (used to fry fish) and deep fry until the batter turns golden. In parts of Scotland you can also get deep fried ice cream. We are now onto the N's with Nairne, Napier, Nasmyth, Newall, Newark, Newburgh, Newhaven, and Newton added this week. NAPIER, a surname of considerable antiquity both in Scotland and England. It is principally, however, Scotch. There is a charter of the 44th of King Henry III. (1259), “Johes le Naper, venator Regis Haveringe, Maner, 18 acres terre messuag. Essex.” According to an old tradition, mentioned in a MS., temp. Charles I., written by Sir W. Segar, Garter king of arms, quoted in Burke’s Commoners, the surname arose from the following event: -- One of the ancient earls of Lennox had three sons; the eldest succeeded him in the earldom, the second was named Donald, and the third Gilchrist. The then king of Scots being engaged in war, and having convocated his subjects to battle, the earl of Lennox was called on, amongst others, to send such force as he could collect to the king’s assistance, which he accordingly did, keeping his eldest son at home with him, but putting his men under the command of his two younger sons. The battle went hard with the Scots, who were not only forced to lost ground, but were actually running away, when Donald snatched his father’s standard from the bearer, charged the enemy with the Lennox-men, changed the fortune of the day, and obtained a victory. After the battle, as the custom was, every one reported his acts, when the king said, “You have all done valiantly; but there is one amongst you who had ‘Nae Peer,’” (that is, no equal); and, calling Donald to him, commanded him to change his name from Lennox to Napier, and bestowed upon him the lands of Gosford, and lands in Fife, as a reward for his service. This is just a specimen of the old legends with which is worthy of the slightest credit. The name was originally Le Naper, and seems most likely to have been derived from an office attached to the court, such as Le Botiler, Le Gros Veneur, &c. In England, says Lower, (English Surnames, vol. ii. p. 206,) William de Hastings, temp. Hen. I., held the manor of Ashele, co. Norfolk, by the service of taking charge of the napery (table-cloths and linen) at the coronation of the English kings. I dinna think that in a’ nature there’s a mair curiouser cratur than a monkey. I mak this observe frae being witness to an extraordinar’ event that took place in Hamilton, three or four days after my never-to-be-forgotten story of the ‘Battle of the Breeks.’ Some even gaed the length to say that it was to the full mair curiouser than that affair, in sae far as the principal performer in the ae case was a rational man, whereas in the ither he was only a bit ape. But folk may talk as they like about monkeys, and cry them down for being stupid and mischievous, I for ane will no gang that length. Whatever they may be on the score of mischief, there can be nae doubt, that, sae far as gumption is concerned, they are just uncommon; and for wit and fun they would beat ony man black and blue. In fact, I dinna think that monkeys are beasts ava. I hae a half notion that they are just wee hairy men, that canna or rather winna speak, in case they may be made to work like ither folk, instead of leading a life of idleness. But to the point. I ance had a monkey, ane of the drollest looking deevils ye ever saw. He was gayan big for a monkey, and was hairy a’ ower, except his face and his bit hurdies, which had a degree of bareness about them, and were nearly as saft as a lady’s loof. Weel, what think ye that I did wi’ the beastie? 'Od, man, I dressed him up like a Heelandman, and put a kilt upon him, and a lang-tailed red coat, and a blue bannet, which for security’s sake I tied, woman-like, below his chin, wi’ twa bits of yellow ribbon. I not only did this, but I learnt him to walk upon his twa hinder legs, and to carry a stick in his right hand when he gaed out, the better to support him in his peregrinations. He was for a’ the world like a wee man in kilts—sae much sae, that when Glengarry, the great Heeland chieftain, wha happened to be at Hamilton on a visit to the Duke, saw him by chance, he swore by the powers that he was like ane o’ the Celtic Society, and that if I likit he would endeavour to get him admitted a member of that body. I thocht at the time that Glengarry was jokin’, but I hae since had gude reason for thinking that he was in real earnest, as Andrew Brand says that he and the Celts hae been like to cut ane anither’s throats, and that he micht mean this as an affront upon them. Hoosomever I maun do Glengarry the justice to say, that had he got my Nosey (that was his name) made a member, he wadna hae pruved the least witty or courageous o’ the society, and would hae dune nae disgrace to the chief ’s recommendation. The "Lady Somerville's Maidens" is a continuing series in this publication so if you haven't been reading it you should go to the index page of this volume and find the other chapters. Those were pleasant days when Madam Romieu was in a measure recovered, but Euphame Napier still made one in the clockmaker's household. They were strangers and not rich, they occupied a few close rooms in a noisy street of the old town of Edinburgh, in the summer season. They had no attendant, no show, no state, and very simple indulgences; but they had their enjoyments, and one of them not to be had in the exchange of green meadows, and babbling brooks, and forest trees, was this street, this curious thronged street, with its giddy gables; its masses of building; its unequal chimney-stalks, and stairs and turrets, and hanging storeys; its various and suggestive groups; under the glory of a pearly dawn, ere the smoke, dust, and noise of common day filled it, when the fragrance of flowers from distant pleasances searched even into its stale and noisome nooks—under the brooding heat of noon—beneath the soft rosy stain of sunset, lingering like the last blush of innocence. But the chief heart's-ease within the walls was within the godly, elevated, loving minds and hearts of the heads of the family. "True happiness is of a retired nature," writes Addison, "and an enemy of pomp and noise; it arises, in the first place, from an enjoyment of one's-self, and in the next from the friendship and conversation of a few select companions." The highest happiness extends beyond self, but Addison will write with a reservation; he adds, "False happiness loves to be in a crowd to draw the eyes of the world upon her;" proceeds to contrast the true by the examples of the virtuous Aurelia, spending her time usefully with her husband in retirement, and the meretricious Faustina, calling every woman of a prudent, modest, and retired life, a poor-spirited and unpolished creature, to whom, in her own person, ''the missing of an opera the first night would be more afflicting than the death of a child." With the suppression of the rising of the '45 the history of Scotland, from a purely national point of view, may be said to come to an end. The Rebellion was something more than an attempt to restore the Stewart dynasty. It was the dramatic and final stage in the inevitable conflict between two antagonistic ideals—the feudal and the industrial. At the Union Scotland had entered into partnership with England in commerce and industry; but sentiment dies hard, and many, while alive to the superiority of the new days, gazed regretfully upon the days which were vanishing. At the Union Scotland gained much, but it paid a heavy price in the loss of its individuality, which meant the loss of the sharp dramatic contrasts and the vivid heroisms which make the sixteenth and seventeenth centuries illustrious. 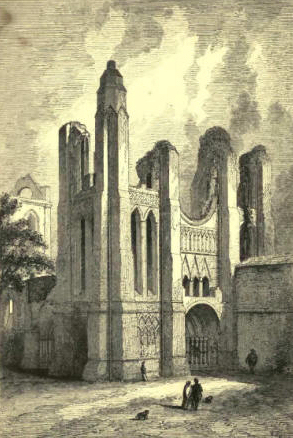 For his action in connection with the Sutherland Clearances, Patrick Sellar was placed on trial at a sitting of the Circuit Court at Inverness in 1816. The bench was occupied by Lord Pitmilly. We give the indictment, defences, judge's summing up, and other particulars, but omit the evidence, as no authentic record thereof is available. THE land of the thistle and the heather, the castle and the crag, is at best but a narrow land—two hundred and eighty-eight miles between extremes from north to south, and fifty-two from east to west. Its place in history, however, is well assured, and its influence is wide as the world. Its physical aspect is exceedingly diversified and picturesque. The sky bends in beauty, the soil teems with verdure, the air rings in elastic tension, the waters sparkle with life and health. It is a land where youth may drink in exhilaration with every breath, manhood find food for high endeavor in every battle of life, and old age flourish like the evergreen pine. With a coastline of twenty-five hundred miles so deeply indenting the main land on three sides as to bring every foot of it within forty-five miles of the sea, with nearly eight hundred islands closely environing it and furnishing many a quiet inlet and many a bold outlook to the ocean, and with an alternating panorama of highland and lowland, of lake, river and mountain, through all its borders,--Scotland would seem to be the spot of all the earth ordained by Providence for the dwelling-place of a hardy, athletic, gallant race. Such, in fact, have been its destiny and its history. It is not the country, but the heroic people inhabiting it, that has given Scotland its name in history and its influence on the world's civilization. And the object of this monograph is to sketch in briefest outline a few salient points in the character of the people, the work they have done and the influence they have exerted. Who has not admired the genius and gloried in the heroism of that long line of "Scottish worthies" who fought as if they were fighting the battles of all mankind and gave their names to history as an everlasting remembrance? Who has not followed them down from century to century and often felt his indignation ablaze at the recital of their wrongs and their sacrifices for truth and for conscience' sake? What associations crowd upon us, what memories awake, what inspirations kindle, at the mention of such names as Bruce and Wallace, Knox and Melville, Argyle and Murray, rray, Gillespie and Henderson, Erskine and Chalmers, Scott and Burns, Livingstone and Alexander Duff! Another new book and of course Arbroath Abbey is where the Declaration of Arbroath was signed and so a most interesting account.